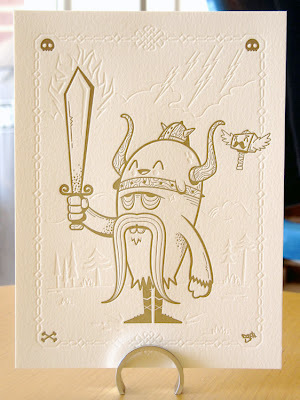 Argentine design duo DGPH's second contribution to LP's Artist Series is this outrageously cute Viking. Printed in gold with a blind debossed border and details. Although this print is part of the Artist Series we have decided to avoid the additional cost and time that shipping to Argentina takes, and offer this print as an UNsigned/numbered edition. This allows us to offer it at a Beat the Recession Series price, and ship immediately to customers! Visit the Artist Series Store for purchase info.